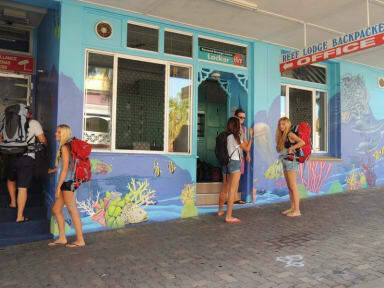 Reef Lodge Backpackers i Townsville, Australien: Reservér nu! The Reef Lodge was once reviewed as ' Very quaint, kind of like a little village in the center of the city.' Townsville’s most centrally located budget accommodation, Reef Lodge is a short 500m walk to the Beautiful “Stand” beach and we are only 500m from “Magnetic Island” ferry, Greyhound and Premier bus terminal. It has everything you need for a great stay in the Capitol of North Queensland. With the CBD within 500m of the Reef Lodge. The Aquarium Reef HQ, Museum and Cultural Center are just over the road. We have built our reputation on being a quiet, laid back hostel where you can chill out and recharge. Reef Lodge is not a party hostel, we pride ourselves in being a quiet and clean property were you can chill out and relax. We cater to international tourist as well as the domestic travelers At 10-30pm we ask people to settle down, respect the other travelers by, keeping noise to minimum and ask people who wish to continue the part. This is a strictly over 18 hostel, so we only accept guests over 18 years old. Office hours: 8am till 8pm Arrivals out of these hours must be organized prior to 6pm on your day of arrival by phoneing our reception . Check out time is 10am, you and your bags must be out of your room. Your sheets, towels and key brought to the office for check-out. You and your bags need to leave the hostel no later than 12:30 pm. For the comfort and consideration of all the guests staying at the Reef Lodge. At 10:30 pm, we ask that people turn off stereos and keep noise to a minimum. No consumption of alcohol after 10:30 PM. There are no visitors allowed into the hostel at any time of the day or night. A $20-00 cash security deposit is required to cover, key, kitchen, linen at check-in. Any damages will be paid for prior to leaving Reef Lodge. This is a strictly over 18 hostel.